LOS ANGELES (AP) -Willie Mitchell's broken stick allowed the Los Angeles Kings to break a scoreless tie. In overtime, the Vancouver defenseman's stick stayed in one piece on another slap shot that Ryan Kesler tipped in for the game-winner. Kesler also scored the tying goal with 2:41 left in regulation, helping the Canucks rally for a 2-1 victory and avoid a four-game season sweep by Los Angeles. "I thought we pretty much dominated the game the whole way," Vancouver goalie Roberto Luongo said. "Unfortunately they got the lead on a bad break when Willie's stick broke, but we stuck with it." The Kings, who have the worst record in the NHL, were outshot 37-18 in regulation. Dan Cloutier stopped the first 33 shots he faced before Kesler got the equalizer. Alex Burrows took a 20-foot wrist shot from the left circle, and defenseman Lubomir Visnovsky blocked it with his right skate while Cloutier kicked out his left leg. However, Kesler was right there for the rebound. "We knew we were playing a solid game and we knew we were throwing pucks on the net," Kesler said after his fourth two-goal game of the season. "Cloutier was playing really well, but we just kept saying, 'Get traffic and pucks to the net and something's going to go in.' And that's what happened. They played us hard, but we just found a way to win." Mattias Ohlund rang one off the left post just seconds into OT, but Kesler recorded his second game-winning goal just 16 seconds after the Kings killed off an interference penalty against Rob Blake. The victory was Vancouver's 100th in overtime during the regular season since the format for breaking ties was instituted by the NHL in 1983-84. The Canucks' lifted themselves into a tie with Colorado for seventh place in the Western Conference playoff race, two points ahead of ninth-place Nashville. Patrick O'Sullivan scored the Kings' goal with 11:33 left in the third period, moments after Mitchell's mishap with his stick while attempting a slap shot in the Los Angeles zone. Dustin Brown took off with the puck and started a 2-on-2 rush, with Mitchell one of the defenseman back. O'Donnell got a cross-ice pass from Brown near the net and whipped his 19th goal past Luongo's stick. 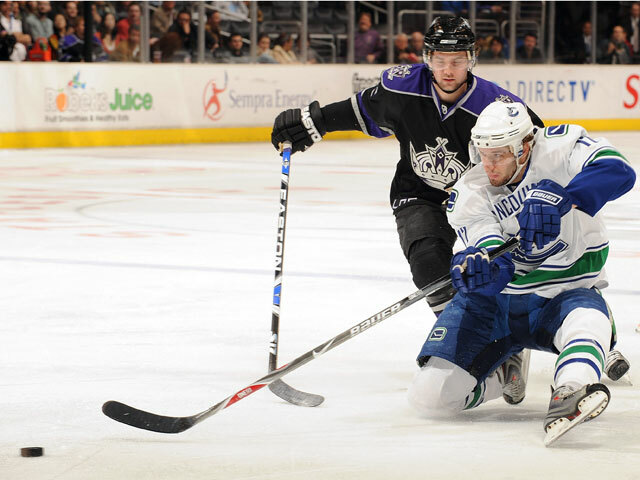 The Kings' only season sweep of Vancouver was a four-game set in 1980-81. Cloutier, who was traded by the Canucks to the Kings in July 2006 for a pair of draft picks, is 0-2-2 against his former team. "We were so close to it. That's what's so disappointing," Cloutier said. "That's a very good team that's fighting for their lives over there. We gave them a big scare, but it would have definitely been nice to steal those two points from them." Vancouver's top three point producers - Henrik Sedin, Daniel Sedin and Markus Naslund - did not have any goals in the four games against Los Angeles this season. The trio has combined for 61 goals and 179 total points through the team's first 69 games. Center Brendan Morrison returned to the Vancouver lineup for the start of a four-game road trip, after missing 38 games with a nagging wrist injury that required surgery. He had played in 542 consecutive games, the longest active streak in the NHL at that time. 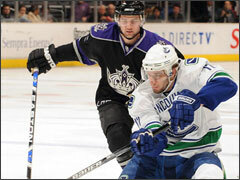 It ended after the Canucks' 4-2 loss to the Kings on Dec. 10. Morrison's injury occurred during an exhibition game against San Jose on Sept. 26, when he jammed his wrist into the boards while taking a hit. He played in Vancouver's first 30 games of the regular season, getting eight goals and 12 assists. "He played pretty solid for a guy that hasn't played for a few months," Burrows said. "It's great for everybody to see him back. He's a great teammate to have in the locker room and he's one of the most skilled forwards on our club. So we're happy to have him back, and he's going to be even better next game." Morrison played eight shifts totaling just over 8 minutes and had two shots on net. "I felt a little lost early on - there were a couple of double shifts I got caught on in-between. But I felt pretty good as the game went on," Morrison said. "It wasn't really a physical issue with me. It was more mental. It was the first time in a long time that I was nervous before a game." Notes: The Kings, who have scored no more than two goals in any of their last six games, are 3-27-3 this season when they fail to get at least three. ... Canucks C Trevor Linden, who has played in a franchise-record 1,129 games, was a healthy scratch for the third straight game. ... Cloutier's seven shutouts with Vancouver in 2001-02 still stand as the most in a single season by a Canucks goalie. Luongo is one away from tying that mark. ... Luongo has started 15 consecutive games and 31 of Vancouver's last 33, after sitting out four straight with bruised ribs. His record during that stretch is 18-10-6.